Industry observers seem to be looking for signs of a venture investment slowdown. Here at Wing, we’ve been contacted by multiple journalists, analysts, limited partners and others with this question on their minds. It’s a natural question to ask when a bull market has run as long and as hard as the current one. To answer these questions, we turn to our in-house V21 Analysis. The V21 tracks the investment activity of a select group of the industry’s top venture firms. It is no secret that most startups fail, and that returns for the median venture firm often lag the S&P 500. The V21 data set represents more of the quality and less of the clutter. 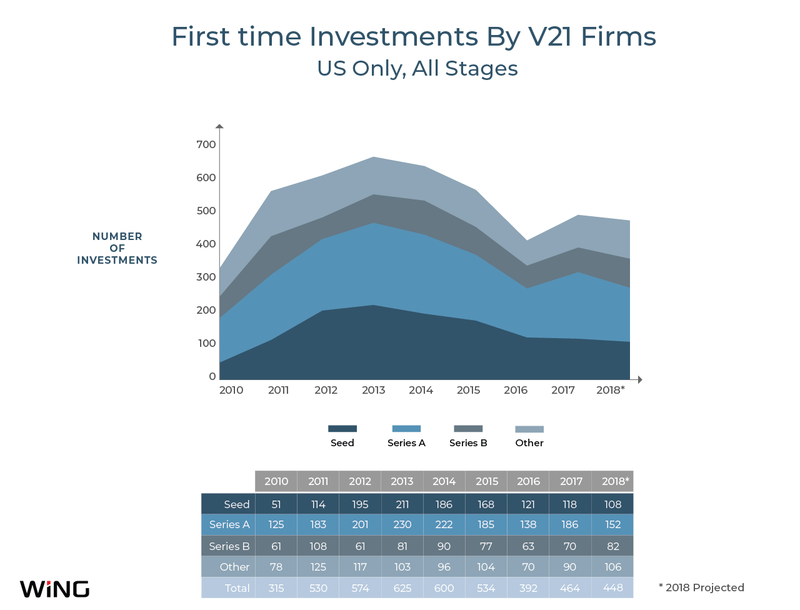 It turns out that contrary to any fears of a slowdown, 2017 and the first half of 2018 have actually seen an increase in new investment activity by the V21. The slowdown story should have been written in 2016, when investing activity from the leading investors hit its lowest point. If the most recent years’ data show anything, it is a modest uptick. 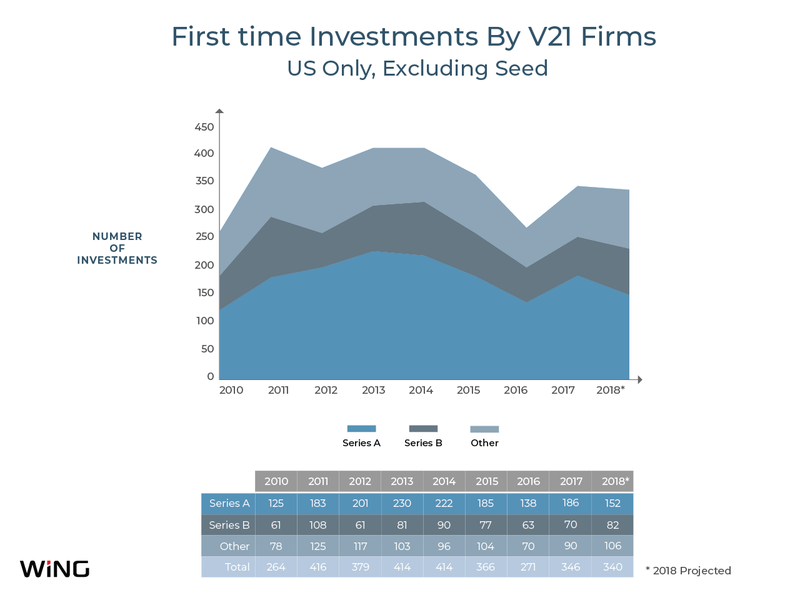 While the V21 as a group has held a steady investment pace over the past several years, there is wide variation within the group. Some big names such as Accel and Greylock appear to have pulled back in 2018, while others like Sequoia and Andreessen-Horowitz have accelerated. We can’t get too excited about these findings, though, given the notorious lumpiness of venture investing and endemic under-reporting issues for most-recent time periods. Will there be an investment slowdown in the future? Yes! Venture capital is a cyclical business. An acceleration like the one we’ve been experiencing will inevitably be followed by a downturn. That’s an easy statement to make -- it is far more difficult to say when that downturn will occur, and how deep it will be. For this reason, the best venture firms invest steadily through hot markets and cold, not attempting to time the market cycle but instead focusing on opportunities to create enduring companies and long-term value. 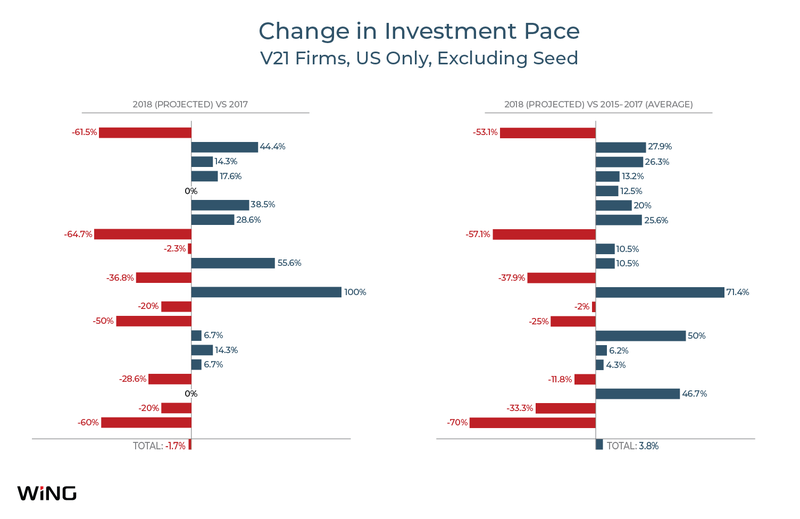 We looked at V21 investment data from multiple angles and kept coming to the same conclusion: the real investment trough was in 2016. The V21 made 551 first-time investments in 2017, across all geographies and stages, and is on pace to make 522 in 2018. This represents a modest uptick from 2016, which was the slowest year since 2010. New investment activity peaked in 2013 and 2014, when the V21 made 716 and 730 first-time investments, respectively. Because some of the V21 have large international investment practices, with their own investment cycles, it is often instructive to remove international investments and look at US activity in isolation. In this case, however, we see essentially the same pattern as in the worldwide data: peak years in 2013 and 2014, declining to a trough in 2016, followed by a modest recovery in 2017 (and 2018 to date). Seed activity can be a source of volatility within the V21. It’s not their core business, so is more prone to fluctuations. Some firms that were very active in seed investing several years ago have dramatically scaled back their presence in this part of the market. So we also studied non-seed US investing in isolation. No surprise: we observed the same pattern as before. The 2018 activity of individual firms varies widely. 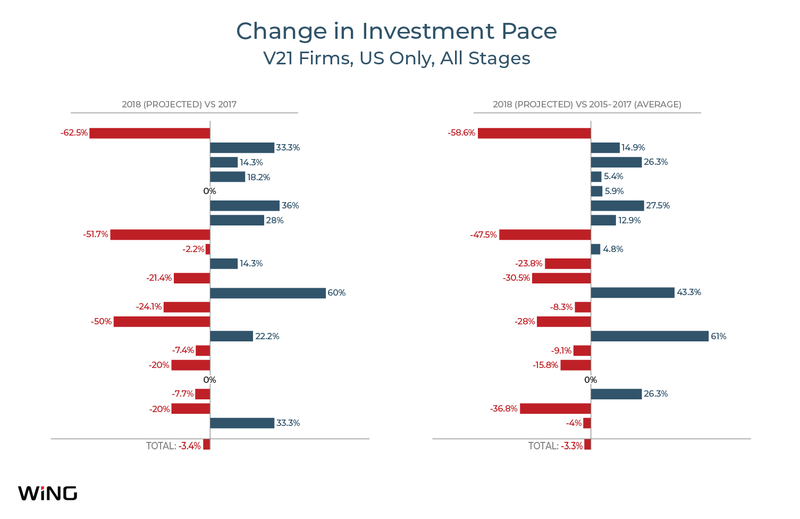 Comparing projected 2018 results to 2017, first-time investments in the US have increased for 9 firms, decreased for 10, and remained static for 2. A similar divergence is seen if we compare 2018 to the 3-year average of 2015-2017. There is a very wide range within the sample, from an approximately 60% decrease to an approximately 60% increase. Removing the seed deals from the sample doesn’t change the overall pattern. Meanwhile, the aggregate is stunningly stable, with none of the group comparisons showing more than a 3.8% move in either direction. Finally, we analyzed the first-time investment activity of 5 noteworthy bellwether firms independently. For the most part, these firms are pictures of stability, operating within a well-worn range of investment pace. The notable exception is Andreessen Horowitz, which burst onto the stage in 2009 and embarked on a steep acceleration through 2013, at which point it swerved into a whiplash-inducing deceleration though 2016. The steepness of A16Z’s run-up and run-down was certainly amplified by its once-prolific seed investing, but the same essential pattern is clearly visible even after we remove seed investments from the sample. It is also worth commenting specifically on Benchmark, which was recently the subject of an analysis by Recode which purported to show a steep decline in investment pace. We’ve been unable to reproduce Recode’s findings and suspect that a number of follow-on investments made from 2008 to 2010 were mis-classified as new investments, distorting the data for those years and causing Benchmark’s investment slowdown to seem more significant than it actually is. Our own data shows that Benchmark’s pace, not unlike that of the rest of the V21, has slowed since the 2011-2013 period but has been quite steady for the past 4 and a half years at least. It certainly isn’t the kind of data that points to a firm in transitional crisis. In general, we are reluctant to draw strong conclusions from individual firm activity in any given year. Such analyses suffer from small sample sizes and are very sensitive to relatively small changes and choices of base year when making time-based comparisons. Winter is Coming. We Just Don’t Know When. It can be daunting to assert there is no sign of a venture slowdown. The tide could be turning even as you read this, perhaps even leading to that long-anticipated correction or – dare we say it – market freefall. But we can say with confidence that the data shows no sign of a slowdown, and may even be indicative of a healthy, sustainable investment pace by the major firms. The very best VC’s understand the impossibility of timing market cycle shifts. But they also know the importance of recognizing which phase of the cycle they are in and operating accordingly. The V21 seem to be operating in a “steady as she goes” mode, with the usual short-term perturbations at the individual firm level but general stability across multiple years and across the group as a whole. It is typically the naïve new entrant that sets the world on fire, investing in hot markets at a torrid clip that ultimately proves to be both unwise and unsustainable. As far as the V21 goes, we see neither dangerous recklessness nor paralyzing fear in their current behavior. Our analysis focuses on first-time investments, which occur when a firm makes its initial commitment of cash to a company. When examining investment pace, it is important to separate first-time investments from follow-on investments. Follow-ons are dictated primarily by existing portfolio companies’ operational cash needs and zero-cash dates. First-time investments, however, are fundamentally discretionary and can be slowed or accelerated freely. If you want to understand capital market cycles, first-time investments are the factor to focus on. Our source of raw investment data is Pitchbook. This is an excellent data source but is not immune to certain problems common to all industry data providers. One problem worth calling out that is highly relevant to this study is a sort of “negative recency bias”. Simply put, there is a lag time between when an investment is made, and when it appears in Pitchbook. Companies usually wait to announce funding rounds in order to achieve a marketing goal. Regulatory filings also have lag times. As a result, most-recent time periods are almost always under-reported, and it can take several quarters for them to “catch up” to prior time periods in terms of completeness. Finally, we should note that venture investing has a high degree of seasonality. There is a well-known slowdown in the summer and over the holidays. Deals may close during these times, but the work leading up to those investments probably occurred previously. It can be hazardous to draw too many conclusions from partial year data (like the data we have for 2018) because it is only drawn from part of the annual cycle.